Randy has accumulated more than 23,000 hours of flight time. In those hours, he has over 30 years of airline flying with United Airlines and took early retirement as a 747-400 Captain. Randy has been an advanced instructor in aerobatics, formation, UPRT as well as a Check Airman and Simulator Instructor in a multitude of aircraft. This vast experience in the training world combined with his Bachelor of Science degree in Aerospace Engineering from the University of Florida fuels his passion to make the corporate and airline industry a safer and more educated environment. 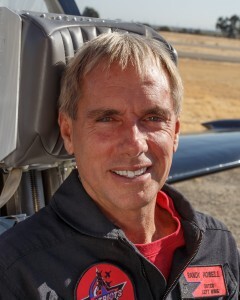 He has flown air shows for 22 years and raced in three different classes at the Reno Air Races. He holds an ATP with 24 different type ratings from MiG’s to the Boeing 747. He holds an unlimited formation aerobatics air show waiver in four jet aircraft including the L-39 and Sabreliner. In 1996 Randy formed, operated and flew as lead pilot on the 2 ship MiG 17 team known as the Stoli MiG’s which continued for a 7 year span. With a passion for aviation since childhood, it became Randy’s mission to create a six-jet precision demonstration team that would inspire, entertain, and educate aviation enthusiasts at Airshows throughout the United States. In 2003 he started the Patriots Jet Team which has grown to the only civilian owned 6-ship precision, aerobatic demonstration team now starting its 15th air show season. The accomplishment that Randy is most proud of is the Patriots Jet Team Foundation, which he founded in 2011. The Foundation educates and mentors youth in America in aviation career paths. The Foundation has partnered with other STEM based Foundations, as well as private, charter and public school programs. Wilbur is a retired USAF fighter pilot with 151 combat hours and 4000 total fighter hours. It began in 1983 when he was accepted into the Air Force Academy and graduated in Human Factors Engineering. Wilbur flew the A-10 “Warthog” in Turkey and Northern Iraq during Operation Desert Storm and the F117 Stealth Fighter during the second Gulf War, Operation Iraqi Freedom. From there, he went to Korea, again flying the A-10, and then Thailand, to teach Thai pilots the missions of Combat Search and Rescue and Close Air Support. After his Far East tour of duty, Wilbur was then assigned back to Great Britain, but this time he wasn’t flying for the USAF. Wilbur was selected to fly with the Royal Air Force in its front-line fighter, the GR7 Harrier Jump Jet. After this third overseas assignment, Wilbur returned Stateside to instruct Taiwanese fighter pilots in the art of Air Combat Tactics or “Dogfighting,” immediately followed by a move into the “black ops” world, flying the super-secret F-117 Stealth Fighter. He was accepted into the Thunderbirds flying F-16’s in 1998 and flew for them until 2001. 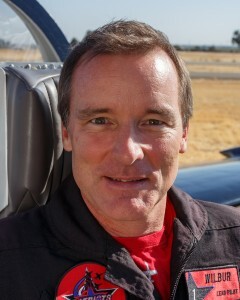 During the 1999 and 2000 air show seasons he flew the #5 Lead Solo position on the USAF Thunderbirds Team. After the Thunderbirds, Wilbur was required to put in “grounded” time as a staff officer. There had been some fatalities in the demonstration flight world and it was Wilbur’s job to reconstruct the program for improved safety. Wilbur’s contribution during this time was significant in strengthening the standards and procedures that would keep pilots and ground crews out of harm’s way. He developed a more articulate understanding of safety protocol that has stayed with him throughout his career. The Patiots Jet Team flew its first air show with Wilbur as the leader in 2004, a position he has held since. He holds an unlimited formation aerobatics air show waiver in the L-39 and Sabreliner. Wilbur also currently flies a Gulfstream for a large corporation.